To have impairment in your thinking ability or to have confusion is a natural phenomenon happening when you start getting old. Decline in cognition power is a part of the normal aging process. If this impairment is a bit more than the expected decline, but not reached to a serious dementia, it is referred to as mild cognitive impairment (MCI). The problems related to memory, judgment, thinking ability and language will be greater than age related changes. You may have a feeling of slipped mental function, but it can be more felt by your partner or relatives. But the condition is still so mild that it will never affect your day – to – day activities. It is very difficult to predict the progress of mild cognitive impairment. Some patient may get a risk of developing more serious dementia with Alzheimer's disease or other severe neurological disorders. Some patients may be constant with the mild impairment and no chances of getting worse and for some lucky persons, it eventually gets better. 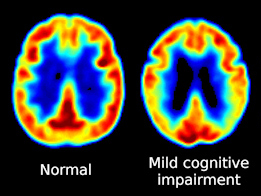 Depending on the cause of cognitive impairment, it can be reversible or irreversible. If you take enough treatment for these causes, your cognition will get improved perfectly. In these cases, the mild cognitive impairment symptoms get worse and can eventually develop very severe dementia. When to get old, your brain will undergo degenerative changes and you will notice a slight memory loss. You may find it difficult to recall a name or incident. Beyond this expectation, if there are any cognitive issues, it can be called as mild cognitive impairment. 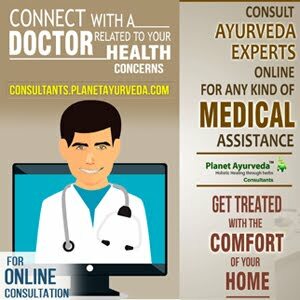 Ayurveda, the science of life has its foundation in the theory of tridosha – vata, pitta and kapha. Each dosha exhibits diurnal variations and also varies according to phase of digestion and age. The life span of a human being consists of three phases, namely childhood, youth and old age. Among these, kapha is having predominance during childhood, pitta during youth and vata in old age. Vata is the factor responsible for the changes in old age. If you have a greater aggravation of vata (especially prana vata) in old age than in normalcy, it may end up in mild cognitive impairment. An excellent memory and intellect improved and loaded with stress relieving capacity, brahmi (bacopa monneiri) bags the best place in managing hypertension, vertigo, anxiety and insanity. It is enriched with the alkaloid, bacoposides. This makes brahmi efficient enough to act as a great antioxidant. Brahmi is an eminent rejuvenator, which makes it very useful in nervous breakdowns. It is a real tonic to nerves, brain and heart. It is best used in restlessness, insomnia, confusion, forgetfulness, hysteria and in cloudy thoughts. Its calming effect on brain tissues and nervous system makes brahmi one of the best medicines for mild cognitive impairment. Dosage – 1 to 2 capsules twice or thrice a day after meals with lukewarm water. Shankhpushpi (Convolvulus pluricaulis) – It is an excellent memory enhancer. Shankhpushpi balances the blood pressure and improves the mental ability. Licorice (Glycerrhiza glabra) – It is a natural intellect and memory enhancer. Its proper use improves the eyesight. Vacha (Acorus calamus) – It is a remedy for your mind. Vacha enhances your coordination and improves memory. Brahmi (Bacopa monnieri) – As already discussed, it is a great memory enhancer. Blood pressure, anxiety, epilepsy and hallucination are also treated well with brahmi. Dosage – 2 capsules twice daily with lukewarm water after meals. These capsules are prepared out from the standardized herbal extract of centella asiatica. These are effective in fatigue, which is a common ailment in old age. Gotu kola helps in dissolving the blood clots, thereby increasing the venous sufficiency. This is very beneficial for those patients who have cognitive impairment due to vascular deficiency. It is also very useful in lowering the blood pressure. The word 'medhya' means which can improve your intellect. So it is clear that medhya choorna will enhance your intellect and brain function. 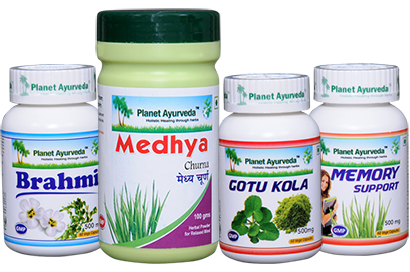 For the manufacturing of medhya choorna, Planet Ayurveda collected the 'medha' improving drugs and mixed it in appropriate proportions. The standardized extracts of useful drugs are used. Use of this choorna will sharpen your brain and rejuvenate your nervous system. As it aids in mental clarity, medhya choorna is best indicated in mild cognitive impairment. Dosage – 1 gram powder twice daily either with lukewarm water or honey.